Working out music intervals is easy once you know how, and this page tells you how! The key to working out intervals is to learn about them step-by-step. Having some knowledge of scales is essential and if you don't already know how to work out a major scale you need to learn. I am working on a page about scales at the moment so there will be a link here soon! an interval is the distance between two notes. So to begin with, all you need to do is count! To find the interval between 2 notes just find the pitch of the lowest note and start counting until you reach the top note. When counting intervals you always start from the bottom note and count both notes. E.g., to find the interval between C and G, begin on C and count up the scale until you reach G.
So the interval between C and G is a fifth. So the interval from D to B is a sixth. If the interval is an 8th it can be written as an octave. If an interval notes are at the same pitch it is called a unison To start with all intervals will be an octave or less. Compound intervals (bigger than an octave) come later! 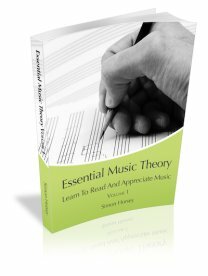 Take this Simple Intervals Quiz to check your understanding of music theory intervals. In addition to a number (distance) intervals also have a quality. This distinguishes intervals which are not part of the major scale. The 5 qualities of intervals are major, minor, perfect, augmented and diminished. Double augmented and double diminished intervals are not common. To begin with we will look at 3 of these qualities. Major, Minor and Perfect Intervals.